1149 West Gorrie Drive. $689,000. 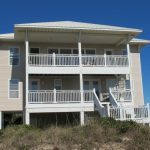 Enjoy outstanding views of the Gulf of Mexico from this well-built home across the street from the beach on St. George Island. 2-story beach house with large porches. Easy beach access to the white sand beaches via county right-of-way directly across the street. The heated pool is 12 ft x 30 ft. Hot/cold outdoor shower, fish cleaning table at ground level. Tile floors throughout with carpet in the bedrooms. First level has 3 BR/3 BA with large porch on the beach side. Top floor has open floor plan with living-dining-kitchen combination opening to a screened porch on beachside and deck on the back side overlooking the pool. Half bath off kitchen. Master suite also on top level. Gas fireplace, lots of natural light. Ideal for vacation rentals or residence. 2104 SEAHORSE LANE, St George Plantation. $529,900. REO. 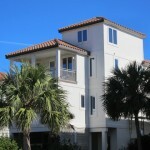 Great 1st tier location in upscale, gated community on St George Island. Expansive gulf views and easy access to the white sand beaches of the Gulf of Mexico. Built on pilings with garage bays for parking underneath, outdoor shower, fish cleaning table, landscaping and pool. Decks, porches and a widow’s walk. 1st living level has 3 bedrooms & two baths plus den that could be used as additional sleeping room. Top level has kitchen, dining, living room plus den with fireplace, and another bedroom & bath. Granite countertops & tile backsplash in kitchen. Vinyl siding, concrete tile roof. Ideal property for rehab project. Sold “AS IS” only. House has damage from a multi-level water leak with drywall and flooring removed in some areas. Elevator does not work. $550,000. Harmony House, at 1130 Durham Drive in Apalachicola, comes with five acres, ten minutes north of town. This unique waterfront property features a cypress house with 3 BR/2 BA plus a screened gazebo, huge garage with climate controlled storage and office, boat dock, boat ramp, piers, chicken coop and lovely native vegetation and landscaping. Very private location. Harmony House, at 1130 Durham Drive in Apalachicola, is on the market for $550,000. 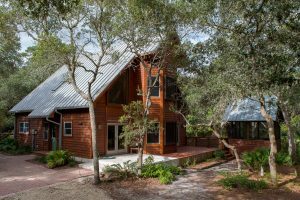 With five acres, this unique waterfront property features a cypress house with 3 BR/2 BA plus a screened gazebo, huge garage with climate controlled storage and office, boat dock, boat ramp, piers and lovely native vegetation and landscaping. 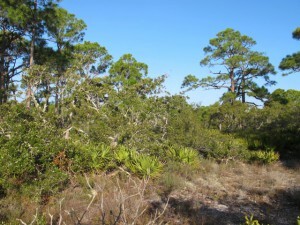 Private location, about 10 minutes north of Apalachicola. PRICE: $349,000. Popular 150-seat restaurant for sale in historic Apalachicola. Offering includes real estate, business and furniture-fixtures-equipment. Formerly AJ’s Bar & Grill, the location is in the heart of the north historic district. Corner location. 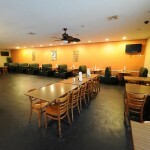 The 3626 sf building has a spacious dining room, large bar, kitchen, restroom facilities and another dining/takeout room with a separate entry. Short sale listing. Restaurant For Sale – Apalachicola: $349,000. FOR SALE: $1,195,000. 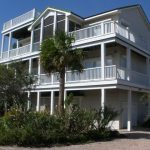 1846 Sunset Drive, St. George Island. “Go Fish” is a spacious 4 BR/4.5 BA, custom-built home with one owner, never rented. 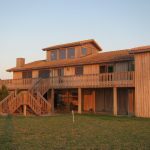 3-stories, multiple large decks, included one screened, and wonderful views. Open floor plan, great space. Expansive great room on 1st living level with living-dining-kitchen takes advantage of the view & opens to wide screened porch. Master suite opens to a private deck on the gulf. Master bath has dressing area, separate shower, jetted tub, 2 walk-in closets. Each BR has a private bath. Water softener system, built-in cabinetry, Andersen doors & windows, outdoor shower, fish cleaning table. Quality workmanship, well-maintained home. Community amenities include pool, tennis, club & cabana area, gated subdivision. GULF FRONT – For Sale: $1,195,000. 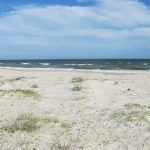 1846 Sunset Drive, St. George Island. FOR SALE: $550,000. 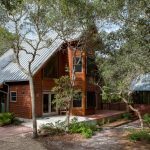 Harmony House is a custom waterfront home on 5-acres 2-miles north of Apalachicola on Mitchell Creek that connects to Scipio Creek. Very private, diverse environment. Beautiful cypress home with a wall of windows to showcase fantastic views. Dock, ramp & pier. Deck, patio, screened gazebo in lush setting with native vegetation & landscaping. Metal roof, high end windows & doors, cypress interior trim, 8-inch baseboards, vaulted ceiling with wood beams, gas fireplace. Kitchen has custom ash cabinets, antique icebox. Tile & bamboo floors. Upstairs has large open loft and private master suite. Separate garage has climate controlled space, cedar storage closet, office. 10-minutes from downtown Apalachicola. 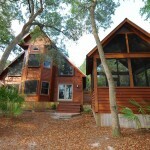 Perfect home for nature lovers with boating, fishing, kayaking, hiking, birding, photography, wild flowers. CONTACT: Helen Spohrer, 850-899-1262 or hspohrer@stgeorgeisland.com for more information or to arrange a tour of the property.